Landing pages are an idibu feature that allow your business to create custom application pages. These are created by your Account Administrator and made available for you to use when posting out your adverts. The advantage of a landing page is that applications are made through a page that has both bespoke branding, and tailor made questions. The benefits are therefore immediate engagement with your brand, while also filtering out applicants that fail to meet your key criteria. This is because questions can be set that will reject candidates at this stage if they do not provide the required answers. In short, this means that you have less chaff and more wheat landing in your vacancy, and more time to do complete other tasks. This article will walk you through selecting and using a landing page when posting your advert from our stand alone system. If you are using idibu inside your CRM, then please refer to our article, Using landing pages inside your CRM. The idibu vacancy details page. The options available to you within either area will also depend on the defaults that have been set by your Account Administrator. If you cannot perform one of the actions outlined below, then discuss this with your Administrator. When you hit the plus button to start creating your vacancy you are immediately taken into the vacancy details page. Complete your vacancy details and at the bottom of this page you will find the 'Landing page settings area' where your landing page can be set. Depending on the default setting of your account and landing page tools, your landing pages will be switched either off or on. My landing pages seem activated, but I don't see the green button? 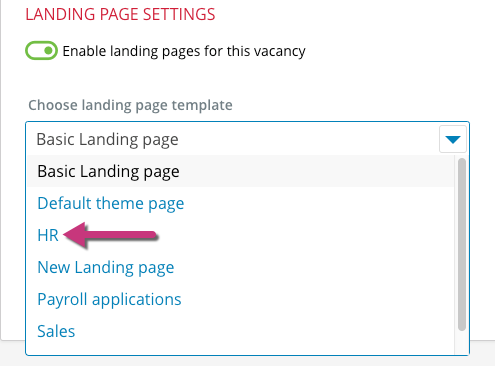 One of the default settings is for landing pages to be active at all times. 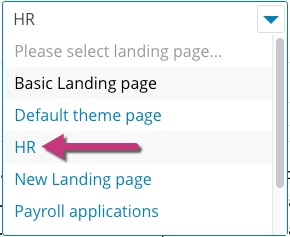 If you cannot see the landing page button, then your account has been set to this default. 1. If landing pages are switched off, click the red button so it turns green to activate landing pages on your vacancy. 2. With landing pages activated you will see a drop down field which you can use to select your landing page. Again, depending on how your account has been set up, it might be that a default page is already selected for you. 3. If your account has more than one page set up and you need to select an alternative page, then click the drop down arrow. 4. A list of available pages will appear, and you can click and select the desired page. 5. Click 'Create vacancy' to save your vacancy details and landing page selection. Your landing page will now be preselected when you post out your advert from this vacancy. 1. As you check through and make any required edits to your advert criteria, you will find the landing page selection field underneath the salary detail area. 2. If a default page has been specified by your account administrator, this will be pre-selected for you. If no page has been specified, or you wish to select a different page, click the arrow to the right. 3. Select the required page from the drop down list that appears. 3. You can now continue to edit and complete your advert, then choose your posting destinations.